Payments (following death) can only be paid to superannuation dependents. If you have insurance outside of super there are generally no restrictions (unless your insurer specifies otherwise). After you’ve considered the pros and cons of holding insurance inside super, you need to determine the level of cover you need. At Tailored Lifetime Solutions we specialise in helping people work out the right amount of cover and type of insurance that best meets their individual needs. Call us on (03) 9851 0300 to arrange a meeting with one of your financial planners. https://www.tdls.com.au/wp-content/uploads/2016/09/lalala3f4808b525a42a0bb340252b3c0de1d3_XL.jpg 1039 900 The Webmaster https://www.tdls.com.au/wp-content/uploads/2016/10/tls-logo-1.png The Webmaster2015-05-27 07:08:172016-09-22 07:16:06AM I BETTER OFF BUYING INSURANCE THROUGH MY SUPER? Way back in the early 1980s it was pretty obvious that the medium term (five year) return potential from investing was pretty solid. The RBA’s “cash rate” was averaging around 14%, 3 year bank term deposit rates were around 12%, 10 year bond yields were around 13.5%, property yields were running around 8-9% (both commercial and residential) and dividend yields on shares were around 6.5% in Australia and 5% globally. Such yields meant that investments were already providing very high cash income and for growth assets like property or shares only modest capital growth was necessary to generate pretty good returns. Well at least the return potential was obviously attractive in nominal terms as back then inflation was running around 9% and the big fear was it would break higher. As it turns out most assets had spectacular returns in the 1980s and 1990s. This can be seen in returns for superannuation funds which averaged 14.1% in nominal terms and 9.4% in real terms between 1982 and 1999 (after taxes and fees). When you make a sacrifice, you’re usually giving something up with the expectation of future gain. Salary sacrificing into your super is no different—you’re giving up ready access to your money in your take-home pay. But in return you’re boosting your retirement savings and saving on tax. You can pay extra cash into your super from your pre-tax salary at the concessional 15% rate of tax1 —up to a limit (or cap) of $30,000 for 2014/15 (or $35,000 if you’re 49 or over). That’s a considerable tax saving for most people on their usual marginal tax rate. With a new financial year fast approaching it’s a great time to get your salary sacrifice arrangement in place – on top of the regular super guarantee payments made by your employer. This way you’ll be able to maximise your concessional contributions and minimise your tax burden over the course of the next financial year. Let’s look at how salary sacrifice could work in practice. 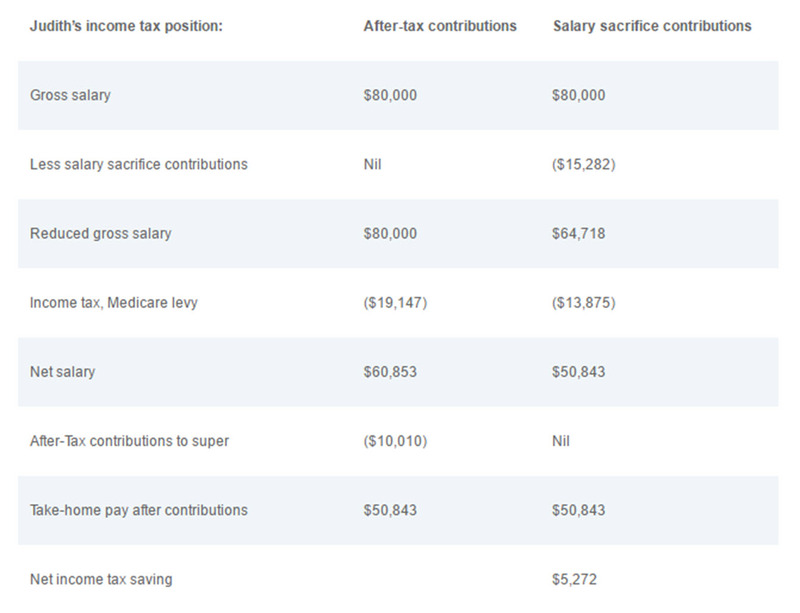 an equivalent pre-tax (salary sacrifice) contribution. In both scenarios, Judith’s take-home pay is the same. But by salary sacrificing into super, Judith can increase her super contributions for the year by $2,980, even after taking the 15% contributions tax into account. Salary sacrifice isn’t without pitfalls. 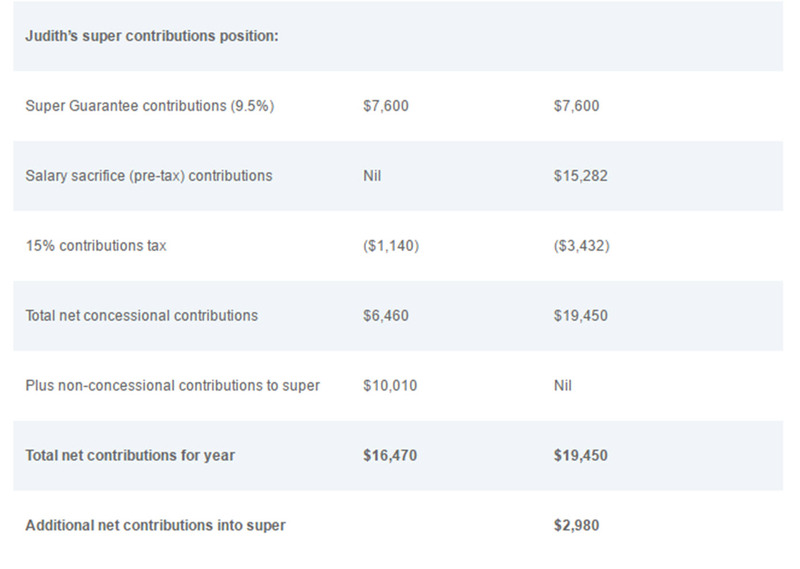 You’ll need to make sure you don’t unintentionally go over your contributions cap or reduce your other entitlements. Here’s a handy checklist to make sure that you’ve ticked all the boxes. Does your employer allow salary sacrifice? Are you under age 75? You can’t salary sacrifice income already earned. Plan ahead to sacrifice bonus and leave payments. the definition of ‘salary’ used to work out your payments. Every employer is different. Make sure you know when your contributions are paid within the financial year so you don’t go over your concessional contributions cap. Download the AMP app and set up an alert to notify you when your payments reach your account. So don’t delay. Make sure you get your salary sacrifice arrangement in place by 1 July to take full advantage of the government’s tax concessions for the next financial year. You’ll soon see the difference when you next look at your super balance. At Tailored Lifetime Solutions, we can help you plan your salary sacrifice strategy and keep track of your contributions cap. Call us on (03) 9851 0300 to arrange a meeting with one of our Financial Planners. 1 Or 30% if you earn more than $300,000 a year. 2015-16 FEDERAL BUDGET – WHAT DOES IT MEAN FOR YOU? The Federal Budget is in and while it may not be as contentious as last year’s there are still some proposed changes that could affect you. Whether you’re a retiree, a family with young children, expecting a new baby or running a small business the budget may have an impact on you. The technical specialists at AMP have put together a brief discussion on the proposed changes and how they affect families on a practical day-to-day level. At Tailored Lifetime Solutions we specialise in helping people achieve their financial goals in an ever changing environment. If you have any questions about how the proposed Federal Budget changes may impact your financial goals call us on 03 9851 0300 to arrange a meeting with one of our Financial Planners. https://www.tdls.com.au/wp-content/uploads/2016/09/budgetf5ddf7bd97d01d87f4a7985398aea709_XL.jpg 900 900 The Webmaster https://www.tdls.com.au/wp-content/uploads/2016/10/tls-logo-1.png The Webmaster2015-05-13 07:31:442018-05-05 22:36:362015-16 FEDERAL BUDGET - WHAT DOES IT MEAN FOR YOU? The last few weeks have seen the investment scene hit another rough patch: US shares have had a fall of less than 2%, but for Japanese shares it was 4%, Australian shares 6%, Eurozone shares 7% and Chinese shares 9%. This note takes a look at the key drivers, whether it’s a correction or something more serious and some of the key threats and risks investors should keep an eye on. https://www.tdls.com.au/wp-content/uploads/2016/09/oliver.jpg 504 900 The Webmaster https://www.tdls.com.au/wp-content/uploads/2016/10/tls-logo-1.png The Webmaster2015-05-12 01:26:522018-05-05 22:36:36CORRECTION TIME? As widely expected, the Reserve Bank of Australia has cut the official cash rate to 2% from 2.25%. This has taken the official cash rate to its lowest level ever and will push mortgage rates down to levels not seen since the mid-1950s. The latest rate cut if fully passed on to mortgage holders should save a borrower with a $300,000 mortgage about $12 a week or $625 a year.